In March after the earthquake, I have worked as a guide twice. One of them was just after the quake. Of course, they had alreadly come to Japan when the disaster hit. I got an e-mail from them while they were staying in Tokyo. Until I met them in Kyoto, I had been wondering how they were spending the time before coming to Kyoto, and whether they could come to Kyoto or not. Finally, I met them on 14th morning. I was relieved to know they were safe, and then asked how they managed to get along. At the time of the quake, they were in Kamakura enjoying sightseeing. Just after the quake, JR in this area was halted, which means they had no way to come back to Tokyo and had no one they knew there. However, a Japanese woman spoke to them, and she opened her private house to let them stay for a night. When they got to her house, they found some other foreign tourists being there. Of course, they all were not aquainted with her at all, and that was the first time to meet each other. In addition, her neighbor also offered what is called Onigiri ,or rice balls, to them. After JR recovered its service, they were able to go back to Tokyo. I was very happy to hear this story, and was proud of being a Japanese. She didn't forget to be kind to others at the time of emergency. That is a wonderful thing, isn't it? They changed their tour plan and decided to stay in Kyoto for the rest of the days in Japan. I showed them to Higashiyama area. Since they were forced to unexpectedly change their plan, I suggeted another tour to them on another day during their stay. They were pleased to accept my offer. Unfortunately it wasn't realized due to the recommendation to come back home by the embassy. 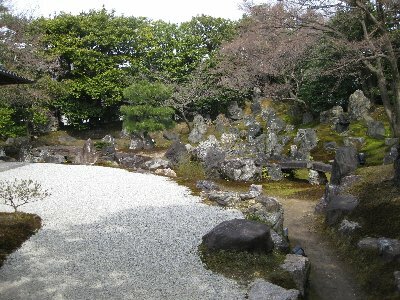 Anyway, we enjoyed tea ceremony, and fully enjoyed beautiful scenery in Kyoto. The life in Kansai area including Kyoto was going as usual. I did the guide as much as I could because they couldn't enjoy another city they were supposed to visit because of the unprecidented disaster. I hope they still like Kyoto and Japan. 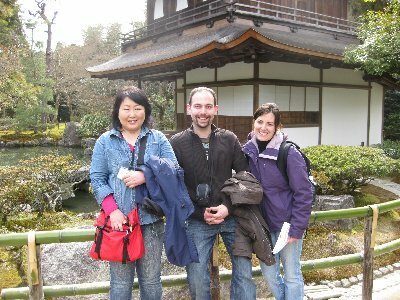 And, if I have another chance to be their guide, I do want to show them to the places not in a guidebook. That was their honeymoon, and the quake kept them from fully enjoying their tour. Thinking of it, I really feel sorry.